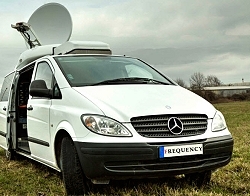 Frequency in Bratislava, Slovakia offers satellite transmissions from its SNG truck. Bratislava, May 2016: The broadcast services company, Frequency, offers satellite newsgathering facilities in its home base - Slovakia - as well as further afield in Europe. New to promoting its services on TVZ, Frequency has a modular set-up in its DSNG truck which allows clients to have equipment configured to their needs. The equipment includes 2 x 400 watt Xicom HPA, 1.2 m Sat-comm dish, multiplexer and dual path with the ability to transmit up to 4 live cameras at once.